I wrote already about Ukrainian trends in world fashion and I have acquainted you to the collections of some world-famous fashion designers, which were inspired by Ukrainian ethnic motives. Also I told you about known Ukrainian designer Roksolana Bogutska who is making her collections in Ukrainian folklore style for many years. Now I found out couple more fashion designers from Ukraine, which made their spring/summer 2009 ready-to-wear collections using Ukrainian ethnic elements. Definitely, it is become very fashionable to have something Ukrainian-themed in your wardrobe! So, if Gucci and Galliano made their collections based on Ukrainian embroidery, Ukrainian Pysanka's (Easter Egg) patterns and Ukrainian folklore costume's cut, Ukrainian fashion designer Olesya Telizhenko was inspired by papercutting art, making her spring/summer 2009 collection. Olesya’s father Mykola Telizhenko (he is a known artist) does a Ukrainian papercutting, actually, Olesya named her collection as “My Father’s Papercutting”. Papercutting it is traditional art in many countries and in Ukraine as well. Another ethnic hit of spring/summer 2009 fashion season in Ukraine is a knit from “Maria Collection” brand, made mostly with elements of Ukrainian floral embroidery. Brand “Maria Collection” is making natural fabrics knit. 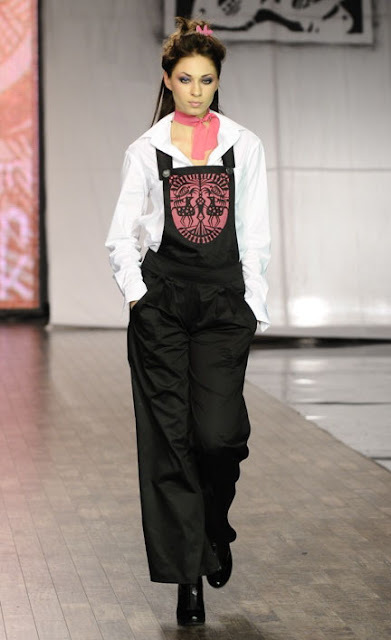 “Maria Collection” is in fashion industry for more than 20 years and it is her first Ukrainian-themed collection. Take a look at some “Maria Collection” stuff of spring/summer 2009! Actually, they are my favorite ones from all the Ukrainian-styled clothes I saw this season.